This week I had the pleasure to meet with sophomore runner Joe Kortenhof. Kortenhof has been running with a purpose this year, making major strides in his running career. Coming off an impressive cross-country season, he has been on fire these last two weeks of the indoor track season. 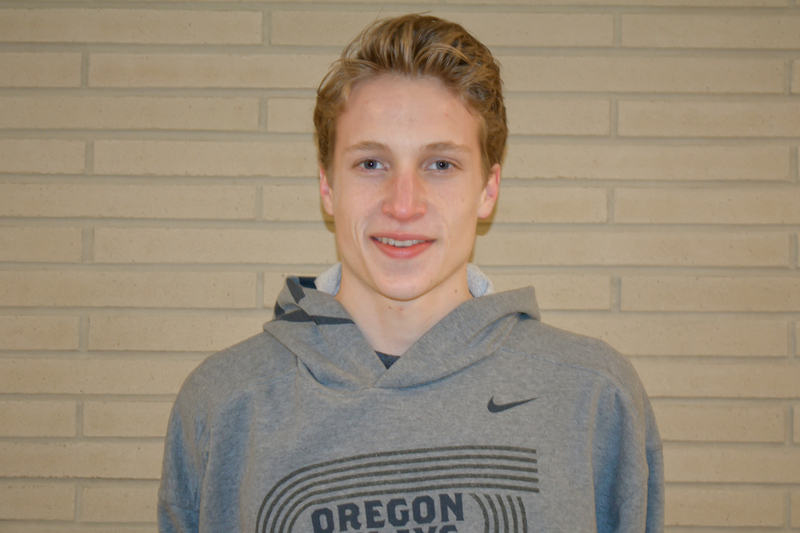 This week, Kortenhof placed third in the mile with a time of 4:32.52. To a mere mortal, it would seem blazing fast; however, he chocks it up to a “speed workout.” Last week, he was first in the 5000 meter with a time of 15:16.31. This is the fastest time in the conference by 19 seconds and ranks 34th overall in NCAA Division III. Shane Farrell: What’s it like winning Midwest Conference track performer of the week? Joe Kortenhof: It’s really fun winning the MWC track performer of the week. This is the second time that I have received this award and it feels nice to have my accomplishments recognized. SF: Last week, you had an incredible performance on the track, winning the 5000 meter and posting the fastest time in the Midwest Conference. How did your legs feel right after that race, and how do you feel you performed? Anything to improve? JK: I felt really good after finishing the 5k last weekend. I mean, I was tired, but I felt strong and fit and really happy about the PR I had just run. In the past, I have struggled with going out too fast and then slowing down a little by the end of the race, so my coach really wanted me to focus on even-splitting (running the same pace for the whole race) this 5k. There weren’t many people in the race, so I knew that I would be leading it which was actually really helpful. I just got out front and settled into my pace and didn’t have to worry about runners clipping at my heels. I ended up pretty much perfectly even-splitting it, and I felt super relaxed the whole race, so I was pleased with how it went. I ended up qualifying for a 5k in Michigan this upcoming Friday, so I am excited to see how that will go. SF: Tell me about your mind-set or warm-up routine going into these distances races. TK: To be honest, I try not to think about racing before the race actually starts because it stresses me out too much. I just try to relax and stay calm before I have to start my warm-up. We usually do about a three-mile warm-up and then some dynamic stretching and strides before getting on the line to race. SF: You had another impressive performance this weekend, coming in third in the mile. What distance can’t you run? You were fewer than two seconds behind Josh [Janusiak]; what type of motivation is that? JK: We ran the mile this weekend because our coach wanted us to get a little speed work in. It was way out of both Josh’s and my comfort zones and wasn’t a terribly fun experience. Josh and I tried to work together in the race, one of us taking the lead from the other every other lap, so it was definitely a team effort. I’m just glad that it’s over with and that I get to run the 5k at my next meet. SF: Has he [Josh Janusiak] been a mentor to you in any way? JK: Josh is more a friend than a mentor to me. We are roommates and spend most of our days with each other, be that running or just hanging out. It’s been awesome to have him on the team with me and has made it much easier to run workouts and races and to work together to push ourselves to be the best that we can possibly be. SF: Speaking of older runners/role models, what type of influence has your big brother Teddy [Kortenhof] been in your running career and life? JK: If it weren’t for Teddy I wouldn’t have started running cross country my freshman year of high school, so in that sense he has taken a major influence on my running career. If it weren’t for him, I wouldn’t have been able to embrace running for what it is and come to love it. SF: What is it like going to the same college as your brother and both running track and cross country? JK: A lot of people think it’s weird that I chose to go to the same college as my brother, but all in all it’s been really nice having Teddy on campus and on the team. He’s been a really positive influence these first two years of college and I’ll be sad to see him graduate this spring.